Q2 Answer the following questions briefly. 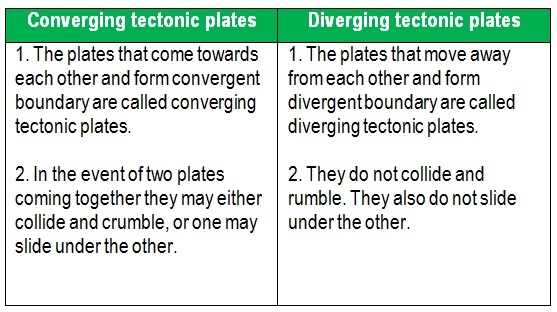 Ans : Tectonic plates are large fragments of earth's crust. Ans : Asia, Africa, Australia, South America and Antarctica. Ans : The Bhabar is a narrow belt of plain which is covered with pebbles and lies along the foothills of the Shiwaliks from the Indus to the Teesta. (a) The great or Inner Himalayas or the Himadri. 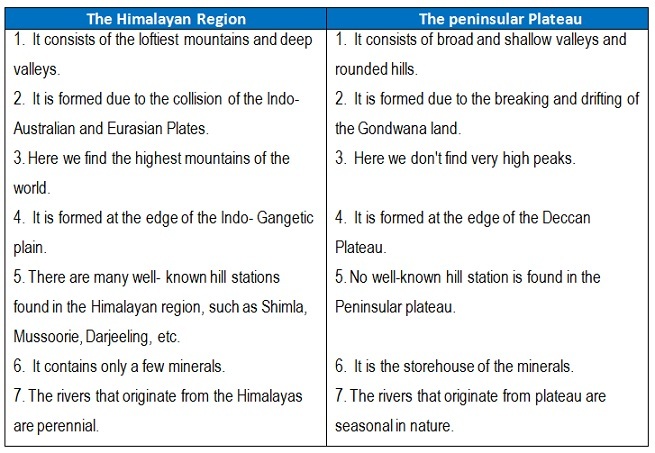 (b) Himachal or lesser Himalayas (Middle Himalayas). (c) The Shiwaliks (Outer Himalayas). Ans : Malwa plateau lies between the Aravali and the Vindhya Ranges. Ans : Lakshadweep Islands group. Q4. Describe how the Himalayas were formed. Ans : It is believed that millions of years ago, India was the part of a big continent, known as the Gondwana land. The Peninsular part of the Gondwana land was the oldest landmass. The Gondwana land included India, Australia, south Africa, South America and Antartica as one single landmass. The convectional currents split the crust into a number of pieces, thus leading to the drifting of the Indo-Australian plate after being separated from the Gondwana land, towards north. The northward drift resulted in the collision of the plate with the much large Eurasian plate. Due to this collision, the sedimentary rocks which were accumulated in the geosyncline known as the Tethys were folded to form the mountain system of western Asia and Himalaya. Q5. Which are the major physiographic divisions of India? Contrast the relief of the Himalayan region with that of the Peninsular plateau. Q6. Give an account of the Northern Plains of India. Ans : The northern plain has been formed by the interplay of the three major river systems, namely--the Indus, the Ganga and the Brahmaputra along with their tributaries. This plain is formed of alluvial soil. The deposition of aluvium in a vast basin lying at the foothills of the Himalayas over millions of years formed this fertile plain. It spreads formed this of 7 lakh square km. The length of this plain is 2400 km and its breadth is 320 km. It is the most densely populated physiographic division of India. 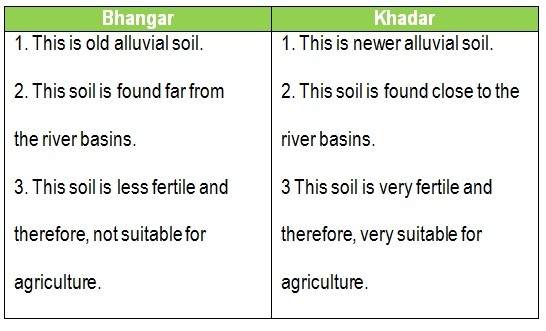 With a rich soil cover combined with adequate water supply and favourable climate it is agriculturally a very productive area of India. The northern plain is broadly divided into three sections. The western part of the northern plain is known as the Punjab plains. Formed by the Indus and its tributaries, the larger part of this plain lies in Pakistan. The Indus and its tributaries such as the Jhelum, the chenab, the Ravi, the Beas and the Satluj originate in the Himalayas. 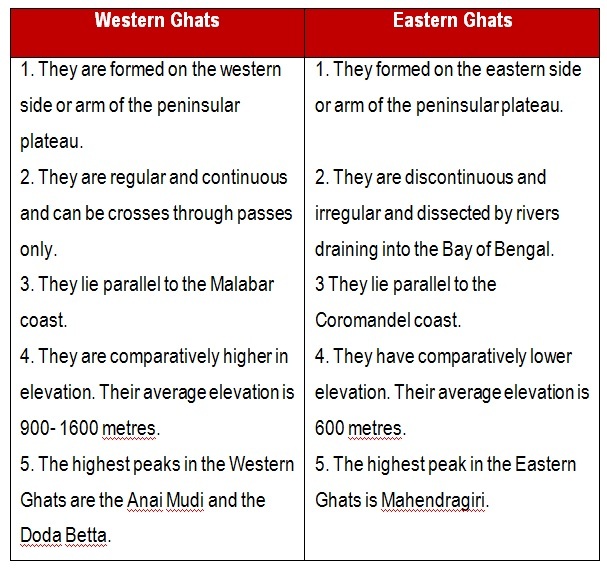 The Ganga plain extends between Ghaggar and Teesta rivers It is spread over the states of North India-- Haryana, Delhi, UP Bihar, partly Jharkhand and West Bengal To its east, Particularly in Assam lies the Brahmaputra plain. Q7. Write short notes on the following. per year. It has arid climate with low vegetatin cover. Streams appear during the rainy season. (ii) The Central Highlands : It is a part of penisular plateau. The part of the Peninsular plateau lying to the north of the Narmada river covering a major area of the Malwa plateau is known as the Central Highlands. The Vindhyan range is bounded by the Central Highlands on the south and the Aravalis on the northwest. The further westward extension gradually merges with the sandy and rocky desert of Rajasthan. The Central Highlands are wider in the west but narrower in the east. The eastward extensions of this plateau are locally known as the Bundelkhand and Baghelkhand. uninhabited, has a bird sanctuary. Andaman and Nicobar islands are bigger in size and are more numerous and scattered. The entire group of islands is divided into two broad categories – The Andaman in the north and the Nicobar in the south.